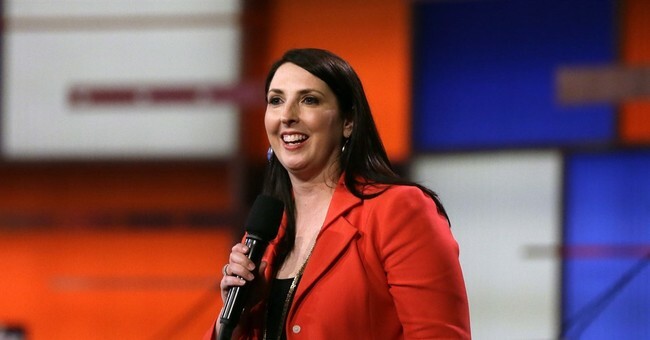 The Republican National Committee on Thursday elected Ronna Romney McDaniel to serve as its chairwoman, and Bob Paduchik to serve as co-chair. McDaniel was unanimously elected, making her the second woman in the committee's history to serve as chair. In remarks, outgoing Chair Reince Priebus said the RNC is now “in the best possible hands” with the new leadership. "Ronna and Bob have been loyal Republicans for years and distinguished themselves with an incredible effort this cycle. They went all out to make sure President-elect Donald Trump won their respective battleground states,” he said. "As the Chairwoman of the Michigan GOP, Ronna led the demolition team that took down that defunct Democrat blue wall. As President-elect Trump said last month, she barely slept this cycle because she was so focused on winning. "It is that level of passion, along with her commitment to building out the ground, data, and digital operation the RNC has been working on for years, that gives me total confidence she is the right woman to lead the RNC,” Priebus noted. McDaniel thanked the RNC for putting their trust in her. "I am a mom from Michigan. I am an outsider. And I am here to make Donald Trump and Republicans everywhere successful,” she said. “For far too long, Democrats have hailed themselves as the party of women. As Republicans, we know their so-called monopoly on being the party of women is false, and it is a mindset I intend to change,” she added. McDaniel went on to note Trump’s movement gave a voice to those who’ve been ignored for far too long and the power to change Washington.